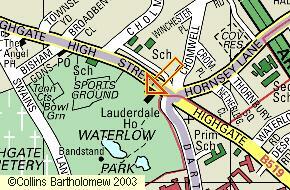 Lauderdale House is situated in Waterlow Park on Highgate Hill. Built in 1582, it is adjacent to Highgate Village and a 10 minute walk, uphill, from Archway Tube Station. As well as providing a home for a variety of shows and events, the House runs a wide range of workshops and classes for children (drama, dance, art, music) and adults (music, visual arts and creative writing). BUSES: 143, 210, 271 (direct to the house), 4, 17, 41, 43, 134, 263, C11 (to Archway Station), 4 and C11 in Magdala Ave NEAREST TUBE: Archway (Northern Line).